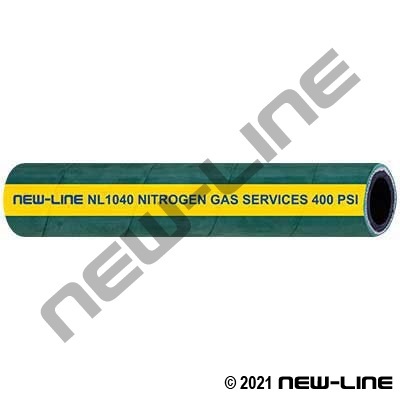 Standard "air" hoses can be used with nitrogen, however many plants and industrial facilities designate certain colours for their nitrogen system to prevent accidental connection or use of nitrogen in general air, confined space, or breathing air systems. A nitrogen enriched environment or system, which depletes oxygen from the air, cannot be detected by human smell and will result in asphyxiation (nitrogen containing no oxygen can only be detected with special instruments). Our NL1040 has an abrasion, weather, and ozone resistant "green" cover. It is also available with a blue cover (NL1041) for those plants or facilities that require blue as their colour of choice for nitrogen. Construction: Tube: Black synthetic rubber. Cover: Wrapped, synthetic rubber (green NL1040, blue NL1041) with a yellow layline stripe. Reinforcement: Multiple plies of synthetic yarn.